Minister Feehan, First Nations leaders and members of West Interlake Water Commission celebrate progress on First Nations Regional Drinking Water Tie-in Program. In 2017, Premier Rachel Notley committed $100 million to deliver clean drinking water to the boundaries of First Nations. Ten projects are now underway that will benefit 14 First Nations across the province. 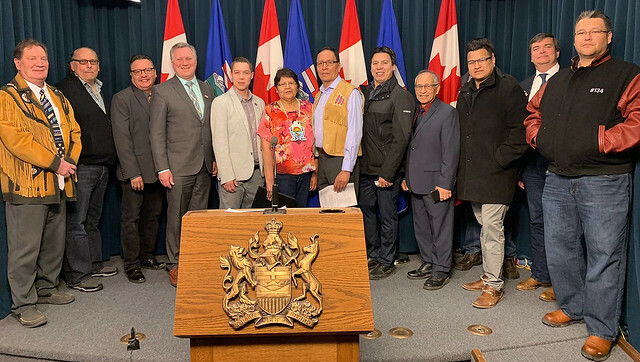 Alberta’s First Nations Regional Drinking Water Tie-In Program is a collaboration between First Nations, the Alberta government, municipalities or water commissions and the federal government. The program supports the elimination of long-term drinking water advisories, while making sure there is sustainable drinking water on reserves. Grants are given to local water commissions or water supply municipalities to extend their service to First Nations.